I wanted to do a proper introduction of the newest doll here at BlytheLife Headquarters as he finally got a name! A very short while ago, I mentioned that I had a new addition, a pink Petworks Usaggie, that was at the time nameless. But no more! The first challenging in naming him was deciding if he was a boy or a girl. First off, pink. Pink generally suggests femininity in this day and age, but something about the face just suggested ‘boy’ to me. Maybe if there was more of a curve to the smile, or if I had gotten the one that comes with painted on lashes, it’d be a different story. But I didn’t, so I decided that the new bunny on the block was a boy. So everyone, I’m pleased to introduce Kanin! And while this is BlytheLife, it’s always fun to share all of my new additions, even if their heads aren’t oversized in comparison to their bodies. He is really cute! 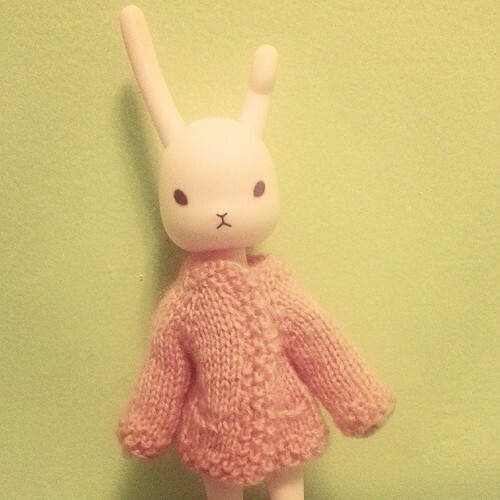 I bought one for my daughter and trying to attach the ears was quite a challenge! I practically had to stand on my head to get them in the holes! Well worth it ‘tho as they are really quality dolls.